My first memory of the Americas Cup was the 1987 challenge in Freemantle – Perth. I had recently started sailing, and was addicted. I must have been 11. I had a little pink Optimist called Dire Straits (after my favorite band). My friends Daniel, Jason and I were all keen sailors and I remember watching the racing on TV at their house over the summer holidays. Their Dad was a builder and he had a lathe which meant that Jason and Daniel could make mini wooden replica Americas cups. This kept us amused all school holidays. 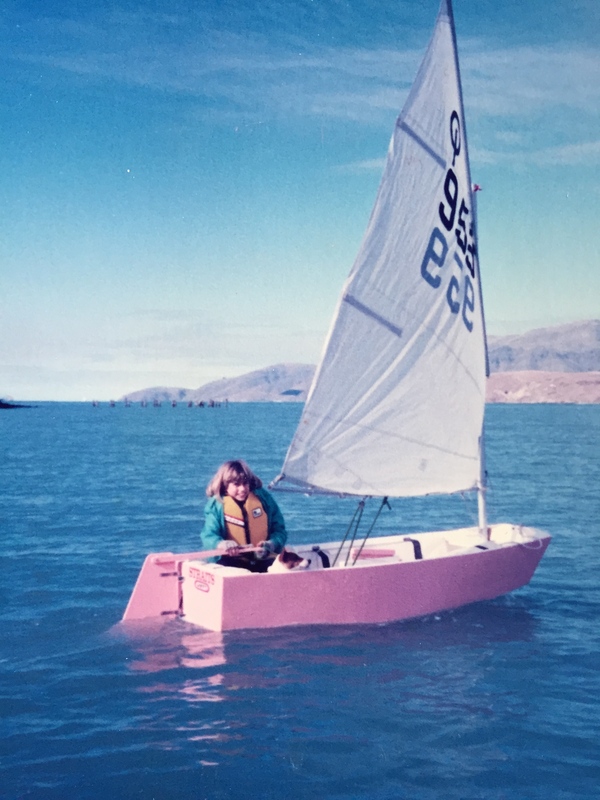 Stars and Stripes won that Americas Cup, and after that New Zealand challenged them again in a catamaran but it turned out to become a long boring complicated battle between the lawyers. Fast forward to 1995 and Black Magic beat dirty Dennis Connor 5-0 in San Diego. This was huge for New Zealand! I remember going out for a champagne breakfast to celebrate. I was just back in New Zealand after spending a few years traveling around the UK & Europe. The team brought the cup all around the country. 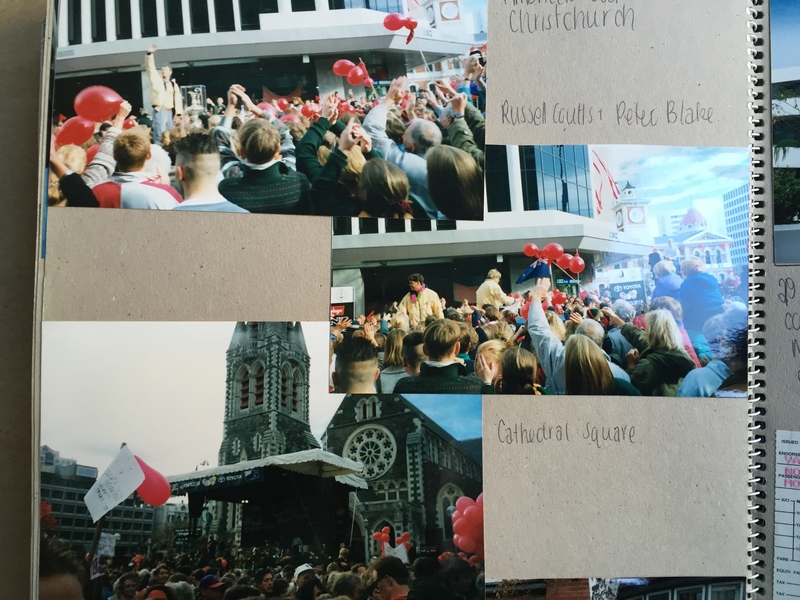 There were ticker tape parades and thousands of people lining the streets to catch a glimpse of the trophy. Tragically a year later some nutter broke in to the Royal NZ Yacht Squadron and took to the trophy with a sledgehammer! Not sure what his problem was but it was a huge embarrassment to the country. Thankfully the same London based silversmiths who had originally made the trophy back in 1848 were able to repair it. The next event was in 1999-2000 and the winner of the Louis Vuitton series was Prada – an Italian team. Team NZ was led by Peter Blake. I had recently started crewing On a yacht called Natural Magic. We were all right behind the campaign. The fundraising included buying lucky red socks which were a favorite of Peter Blake’s, and we all had a pair. The race was won by Russell Coutts and he even let a young Dean Barker have a turn at the helm. 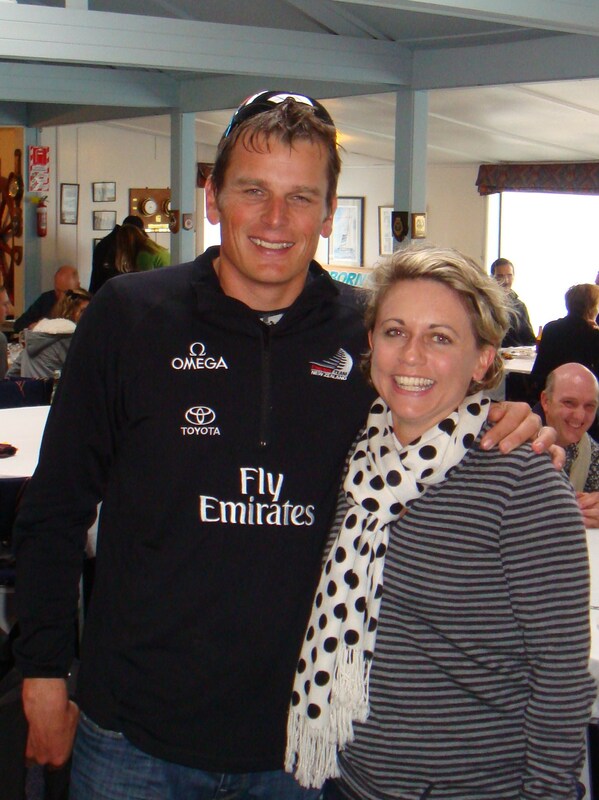 Peter Montgomery the yachting commentator said the famous line “the Americas Cup is still New Zealand’s Cup!” We were so proud! However it all turned nasty when our golden boy Russell jumped ship! He was pinched by Alinghi a Swiss syndicate and boy was he unpopular! Especially when he won the cup off us 5-0 in 2003. There were some big problems with our boats in that regatta. One taking on waves over the side and also a mast breaking. It was bad… I had even rearranged my wedding day so that it didn’t fall during the America’s Cup final! 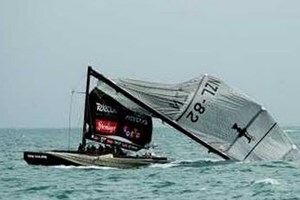 In 2007 the Americas Cup was held in Valencia and some friends of ours sailed their yacht over to watch. Team NZ won the Louis Vuitton and once again were up against fellow NZ’er Brad Butterworth at the helm of the Alinghi team. They won again 5-2. Then 2013 brought about the foiling cats! Wow! This was interesting again. These space ship like water craft flying through the water doing 25kts. Having to tack downwind as their apparent wind meant they were going too fast to gybe (huh? I still don’t get that). 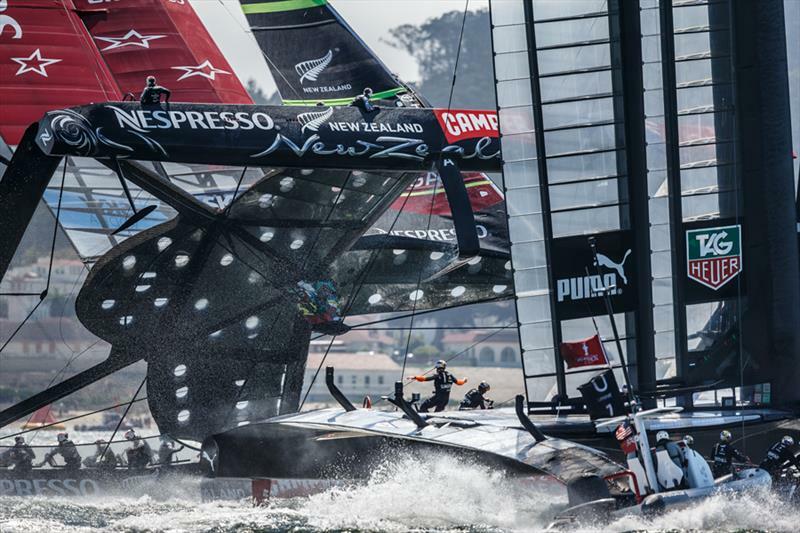 New Zealand sat on the edge of its seat as we won the Louis Vuitton. Even the lefties who complained about how much money the government was spending on funding the campaign were in to it! One race we came to within an inch of capsizing. OMG!! We were on a ski weekend in the mountains with friends watching that race all together and we just about screamed the house down when that happened! But finally we were through to the final! Woohoo!!! Some of my friends flew over to San Francisco to watch the finals. (I would have loved to go too but was already booked to go to Europe!) We had to win 9 races to take the cup and we easily won the first 8. It was in the bag!! The racing was about 8.30am our time, so the yacht club put on a champagne breakfast so everyone could come over and watch what we hoped would be the final! The media were there TV, paper etc. Parents took their kids out of school to come and be part of it! But we lost that race… Jimmy Spittall was now the man we all loved to hate! Never mind we thought, we only have to win one more race! They have to win another 8! We can still do it! So we had another champagne breakfast and another and another… And Oracle was on a winning streak! All the races were extremely close and we even won one of them which was then deemed to be over the time limit. The racing was taking over our lives! I was even pictured on the front page of the paper at the champagne breakfast with a crazed look on my face! Unfortunately I was also supposed to be at work – not at the yacht club! Bummer caught out…!!! I watched Oracle win the Americas Cup on my phone at 2am in Dubai. What an emotional roller coaster! 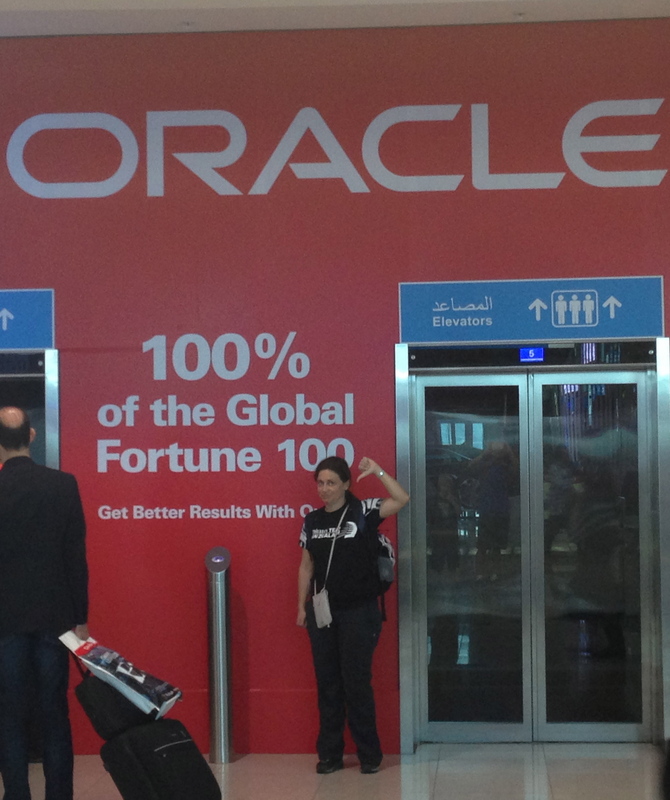 Devastated… and of course I was a poor loser when I saw the Oracle sign at Dubai airport. New Zealand prides itself as being a tiny nation of just 4 million people, that is capable of taking on one of the worlds richest men and nearly winning! In fact a huge percentage of the crew on all the other teams were New Zealanders. As a kiwi sailor I am pretty proud of that. ← Let’s go right back to the beginning…! Thanks Tammy & Steve! Apparently that rule was in place a few years ago. I guess not having it does give more kiwi sailors the opportunity to compete with all the other various teams!